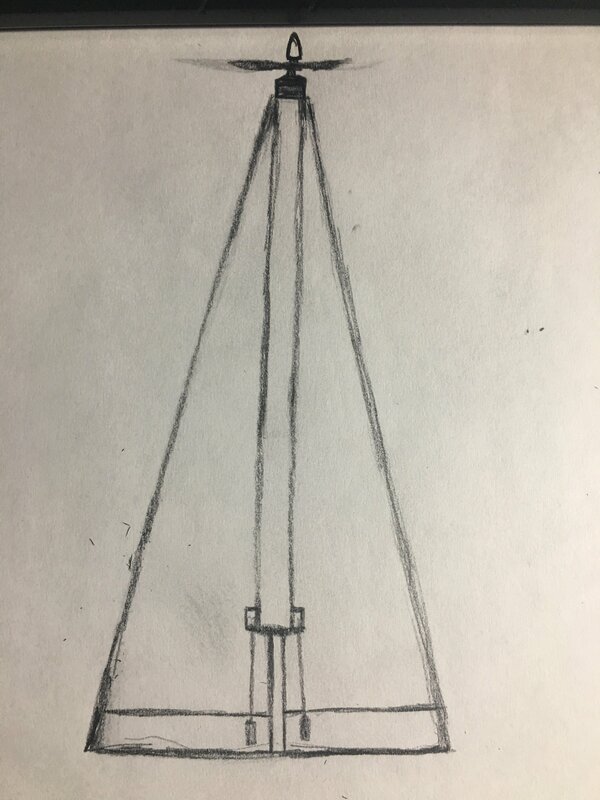 This is a rough quick 2d top view of an idea I had for a simple to build slender delta loosely based on the hp-115 and concord(much more so the hp-115 though).I'm not good at drawing at 3D angles and perspective so I just left a rectangular space to mark where I'd place my vertical stabilizer. One of my failed builds was similar to this, but I had no experience and the wrong materials and was working alone on the spot with no drawn up plan and with no input from those more experienced. Some time after I finish my nutball, fly it some,and perhaps another build off a plan or kit, I'm going to want to try to attempt something like this. 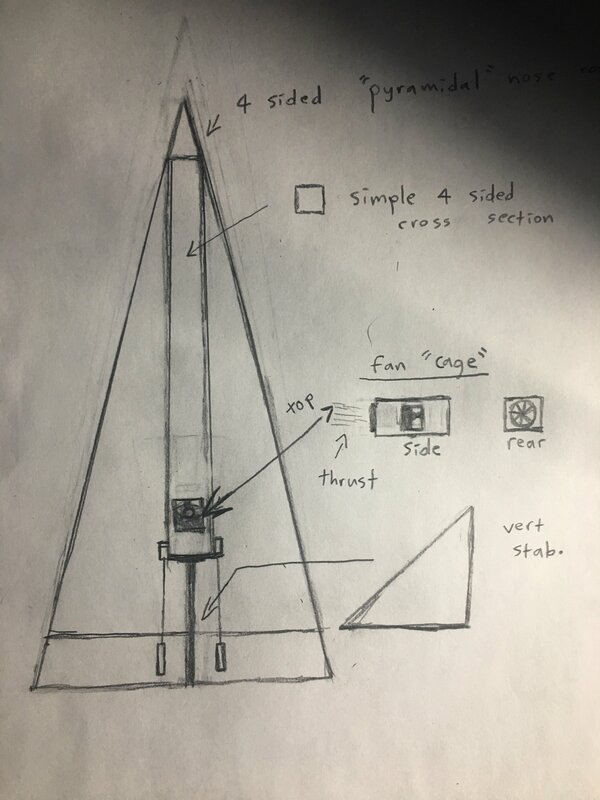 I'll need input to turn it from a rough sketch into a real design with specs and measurements, and I'll need to figure out a list of what exact power system and prop I'll want and an idea of how the electronics will be positioned. Right now looking like long servo leads for the win. My main questions are, how feasible is this build, and does anyone have firsthand experience with slender delta builds?what sort of power system, prop, and size scale should I go with, what building and design challenges can I expect, and how easy will it be to fly and what will its flight characteristics be like? The concept it's based on implies that this shape is efficient at both low and high speeds-but I'm just not experienced enough to anticipate how it would handle. Thanks in advance for helping a newb out! This is my main inspiration, for those unfamiliar. 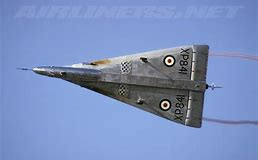 Soon after, Johanna Weber and Dietrich Küchemann at the RAE published a series of reports on a new wing planform, known in the UK as the "slender delta" concept. The team, including Eric Maskell whose report "Flow Separation in Three Dimensions" contributed to an understanding of the physical nature of separated flow, worked with the fact that delta wings can produce strong vortices on their upper surfaces at high angles of attack. The vortex will lower the air pressure and cause lift to be greatly increased. This effect had been noticed earlier, notably by Chuck Yeager in the Convair XF-92, but its qualities had not been fully appreciated. Weber suggested that this was no mere curiosity, and the effect could be deliberately used to improve low speed performance. Küchemann's and Weber's papers changed the entire nature of supersonic design almost overnight. Although the delta had already been used on aircraft prior to this point, these designs used planforms that were not much different from a swept wing of the same span. [N 2] Weber noted that the lift from the vortex was increased by the length of the wing it had to operate over, which suggested that the effect would be maximised by extending the wing along the fuselage as far as possible. Such a layout would still have good supersonic performance inherent to the short span, while also offering reasonable take-off and landing speeds using vortex generation. The only downside to such a design is that the aircraft would have to take off and land very "nose high" to generate the required vortex lift, which led to questions about the low speed handling qualities of such a design. It would also need to have long landing gear to produce the required angle of attack while still on the runway. Küchemann presented the idea at a meeting where Morgan was also present. Test pilot Eric Brown recalls Morgan's reaction to the presentation, saying that he immediately seized on it as the solution to the SST problem. Brown considers this moment as being the true birth of the Concorde project. I think, to start fleshing out the design, I'll scale down the length and width of the hp-115's wing, into a range compatible with one of the FT power packs(which would be perfect, because if this slender delta concept works scaled down and me or somebody else makes a successful one, I could potentially see it becoming a popular flite test kit). I haven't seen many slender delta rc vids, especially original designs. This concord is probably the best I've seen, and that's about the size I'd probably want.
. That design uses a pusher though, would a front driven one like my design still work? If not, I could redesign for that- simple pusher or perhaps even a ducted fan. So basically, If for reference I take the wing measurements of the hp-115, scale them down around a FT power pack, put my basic rectangular fuselage on top of the wing with a nice vertical stabilizer in the back and my prop in the front, add two elevators(no rudder like the concord vid I posted), and then lay out my electronics(especially the battery) for best weight distribution...could it fly? And if it could, could it potentially fly well, or would it be a pain? Being so new, my sketch and design are very rough and fluid right so I can potentially change critical areas based on input I receive here. If, say, adding a rudder will be pretty easy but give me loads more control and make the plane way easier to fly, I'll opt for that. If putting the prop in the back and/or having a very thin, curved fuselage from a single sheet like the concord would be a better idea for some reason, then I will tweak my design that way. 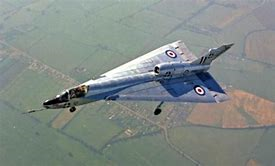 Good luck with the design and build but I should remind you that the original designs and all testing was done as reaction powered aircraft to be flown at high speed. If using propeller power the use of a rear mounted motor is suggested as the spiraling airflow from a nose mounted propeller could/would cause airflow instabilities and a severe tendency to roll uncontrollably especially at take off. The effectiveness of the elevons for low speed roll control is extremely adversely compromised by the small moment for the roll forces generated to act through. Whilst you may proceed with your build it may be possible to fly this design using an EDF power plant though the torque effects may still give some roll instability issues. For the sake of this build I sincerely hope my fears are unjustified! Very helpful. exactly the kind of things I needed to know. I may or may not end up proceeding at some point, but I'd like to continue to theorize and reorganize my design. I'm not super advanced with all this but had a gut feeling that the nose prop would interfere with the vortex effect I'm trying to create with the wing design or somehow otherwise be bad. So my new design will actually resemble the original hp-115 much more closely. It sounds like I'll want a rudder, so I'll be adding that, and I will probably end up using a ducted fan. I'll look at some ducted fan builds and decide where I would position it. In the middle of the craft or at the rear, perhaps underneath the tail just like on the hp-115? I'm actually thinking more towards the center for simplicity's sake..in front of the tail/rudder,verticle stabilizer. that way the thrust blows straight at/past the tail and therefore rudder..which I'm picturing could lend to sort of a partial thrust vectoring effect by the rudder making controllability,maneuverability,and response better. How is that sounding? or, to keep it simpler, I could do much the same: add the rudder, but with a pusher prop mounted just like in the concord video. 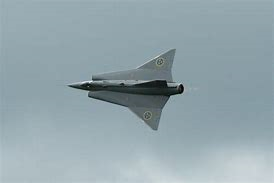 On the other hand, I could take the ducted fan, and just do that the FT viggen does and mount it inside of the fuselage and add some form of intake(s), keep everything inside and the fuselage. that's sounding like the most attractive option. I know the viggen isn't quite the same profile I'm going for, but in a vid I watched, it seems to do fine with only two control surfaces. Could be wrong, but that's all I see. it seems to do fine with only two control surfaces. Could be wrong, but that's all I see. It flies pretty good, needs some alpha (flying with a nose high attitude) due to there being no airfoil. I may still be learning RC Flight.... I know a bit about Aerodynamics. @Hai-Lee makes valid points to heed. Something that narrow will have an inherent instability, and VERY high Wing Loading. You mentioned the Concorde. That is a "Double Delta" Wing, which has smoother level flying characteristics. I would keep the idea open to think about doing that second, wider Delta, halfway through the original design Wing. I do wish you the best of luck, because that would be COOL if she flies!! Yeah that option you mentioned about the secondary delta is something I'm strongly considering. That's a sharp Aircraft too!! I can adapt that to a compound delta wing if necessary but I believe it could have the lightness and power necessary to function with that profile. If I eventually opt for a standard(or contra-rotating for that matter) pusher prop configuration, I'll almost certainly have to opt for the compound wing. That picture is very roughly to 1/10 scale, envisioning about a 700mm wingspan at the widest point in the back with a 64-70mm EDF build into the fuselage. (sucker's gonna be looong, but length is wing surface too to some extent here)For the fuselage and nose cone, I opted with a dead simple 4 sided cross section, with window cuts that form a sort of semi-open "cage" around the edf that allows it to intake without building a wider and more complex fuselage like the Viggen. I have received an incredible amount of help here myself!! I think, given very light weight and enough Thrust, she will fly! FAST, but fly she will. This may not be Scale..... But maybe just a couple of degrees of Dihedral in the Wings, could make it more stable. Maybe! And only about 5-8 degrees. I absolutely love the dihedral idea. I'll be getting hands on experience when I build my nutball in that area. I really like the look of this design. Will there be any plans? I have no experience drawing up plans, but as soon as I get the design fleshed out and finalized, I will learn and draw some up, or send somebody else the measurements and specs that would be interested in helping draw up the plan. What I DON'T have, are spare Electronics! Maybe I could throw one together, for a Test Mule......... Rubber Band powered, to test Dihedral angles. Been considering a draken build with my extra 68 mm EDF don't know how well the intakes would work though.